The study says that young people who don't go to church often still believe in God. (CNN) -- Ministering to young adults at New York's Riverside Church, the Rev. J. Lee Hill Jr. hasn't had much success in recruiting for Sunday morning services. But his mission trips to New Orleans, Louisiana, since Hurricane Katrina and his efforts to connect with older teens and 20-somethings -- the so-called millennial generation -- via Facebook have paid big dividends. "Church is difficult because young people today want to engage actively," Hill said. "They just want to experience God." 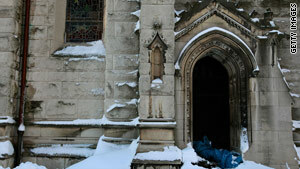 A study released Wednesday by the Pew Forum on Religion & Public life appears to bear that out. On the one hand, it finds that young Americans are significantly less religious than their parents and grandparents were when they were young. But the report also suggests that many of the beliefs and faith-based practices of 18- to 29-year-olds mirror those of their elders. One in four American millennials -- which it defined as those who were born after 1980 and came of age around the millennium -- are not affiliated with any faith tradition, Pew found. They characterize their religion as "atheist," "agnostic" or "nothing in particular." That compares to fewer than one in five Generation Xers -- Americans born from 1965 to 1980 -- who were unaffiliated with a religion when they were in their late teens and early 20s. Just 13 percent of American baby boomers -- those born from 1946 to 1964 -- were unaffiliated with any religious tradition when they were young adults, according to Pew. But when it comes to many beliefs and practices -- like views about life after death, the existence of heaven and hell and miracles -- millennials resemble previous generations of young Americans. For instance, 45 percent of young Americans report praying daily, about the same proportion who said they did in the 1980s and '90s. "While growing numbers of people are unaffiliated, it's not necessarily a sign that they're committed secularists," said Greg Smith, a senior researcher at the Pew Forum. "We're seeing among young people that there are ways of practicing faith and being religious outside of belonging to a religious organization or attending services." Roughly two in three millennials said that they believe in God with absolute certainty, according to Pew, similar to the share of Gen Xers that reported such certainty about God a decade ago. The study also suggests that people tend to grow more religious as they age. Today, a third of baby boomers attend church at least once a week, while just a quarter did in the late 1970s, according to Pew. But Pew researchers said the larger share of millennials who are unaffiliated with any religious tradition is not likely to shrink as that generation ages. About 13 percent of baby boomers reported being unaffiliated in the late 1970s, and the same share remains unaffiliated today. Interestingly, among millennials who do identify with a religion, the intensity of that affiliation is similar to previous generations. About a third of religiously affiliated millennials call themselves "strong" members of their faith, the same as Gen Xers who reported feeling that way when they were young.